Sorbets are a bit like good friendships and general happiness… balance is required to achieve success. Too sweet and they can be off-putting. Not sweet enough and they can be hard-edged… icy. Artificially sweet… not really interested in pursuing. Well... you get my drift. 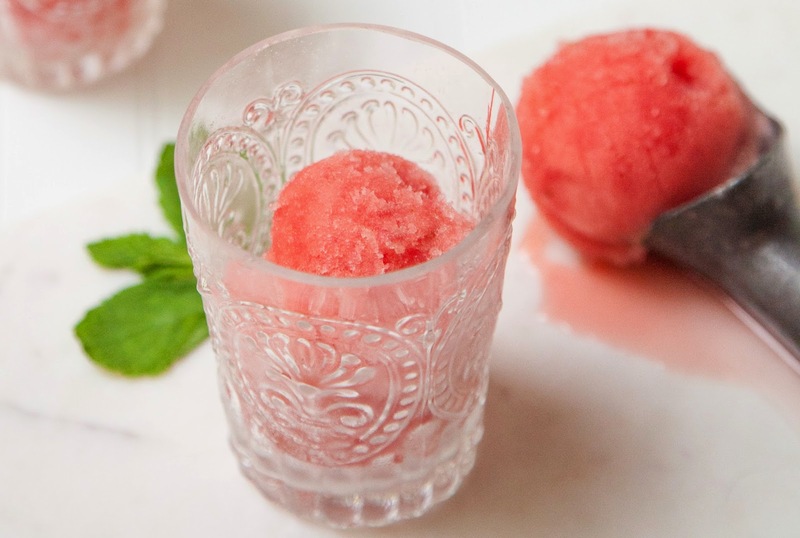 Apart from the flavor profile you’re going after, the right level of sweetness is critical to producing a sorbet that will be both texturally and tastefully pleasing. The good news is that anywhere in that balance zone, the flavor will be great and… truly… from a purely personal perspective, anywhere in the granita to sorbet zone will produce a light, satisfying, refreshing dessert. Then comes the mixing… getting your fruit blend sweetened up just right to please the palate and the spoon. Tasting is always a good test. However, with sorbet, going a bit sweeter is often better as it will temper a bit once it gets its time in the freezer. So what's sweet enough? Too much sugar and your sorbet won't freeze correctly; not enough sweetener and your sorbet will freeze rock hard. Without purchasing technical gadgets to determine the right amount of sweetener to add (there's a whole technical side involving "brix" and such), an “egg test” is a good little barometer for the home cook (and kind of fun to do). More on this later. First I add a good bit of zested lime to my watermelon blend. This base should be place in a bowl that is deep enough to allow an average size egg to sit at the bottom of your bowl with just enough head room to cover from view. Straining your simple syrup through a fine sieve (so as not to get leaves in your sorbet), begin adding some of your syrup to your watermelon blend. Then take a well-washed egg (yep, right from the fridge) and gently place it in the bottom of your bowl. If it doesn’t float up to reveal a nickel size bit of it through the top surface of your liquid then you need more sweetener. Continue adding the simple syrup and testing the egg float. Once the egg rises to view that nickel size portion through the surface of the watermelon blend in your bowl, then you are pretty much good to go. Taste it too… it should be on the sweeter side, but pleasing. Since all your ingredients should still be good and cold, you can then proceed to “churning” in your machine… super cold ingredients into your ice cream/sorbet maker makes for a good churn. With mine (Cuisinart ICE-21), I just get the machine going (simple on-off switch) and then pour my mix slowly in as the machine is turning. It takes about 8 to 10 minutes to get a nice consistency. Place it in the freezer to firm up (the door is a good spot as it’s less likely to get overly hard there). You may have to leave it out to soften a bit before serving (10 to 20 minutes if it’s really firm). Or… churn and serve right away (going a bit beyond the 8 to 10 minutes… or when your machine cuts off telling you it’s ready). Always best to keep an eye on it to ensure its doing its thing correctly. 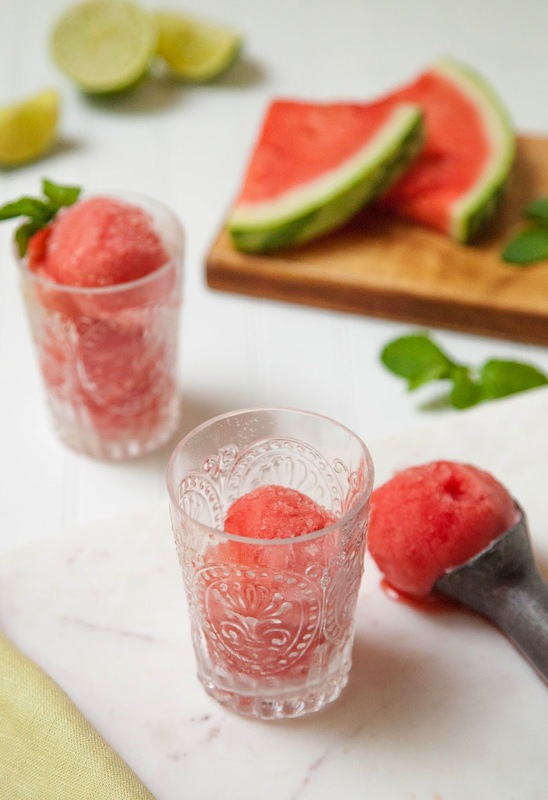 All in all, it’s so refreshing and light, beautifully flavored with the subtle, summer sweetness of watermelon, lightly infused with mint, and brightened with the lime zest. For an added little pop, add a bit more fresh lime zest overtop when serving… it won’t tip its delightful, welcoming balance one bit… making it a happy and enjoyable choice. 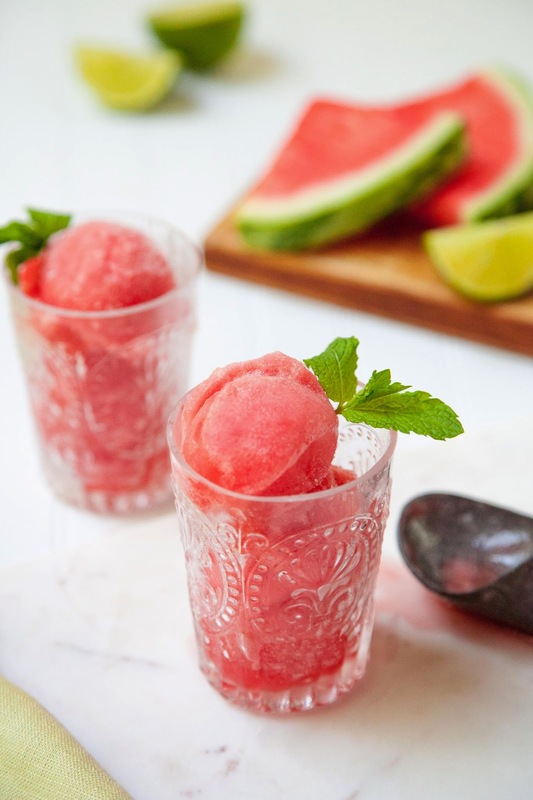 For this sorbet, all the simply syrup was used to sweeten the watermelon base. However, depending on how sweet your fruit it, you may want to make a larger batch of simple syrup to ensure you have enough. Whatever you have left over is great to sweeten tea… or mojitos! Combine sugar, water and mint leaves in a pot over medium high heat. Muddle leaves a bit to break them down just slightly. Bring mixture to a boil, stirring intermittently, then lower heat and continue cooking until sugar is completely dissolved and mixture has reduced a bit; about 1 minute. Remove from heat and set aside to cool. Transfer to a non-reactive container and cover with plastic wrap. Place in fridge overnight, or at least 2 to 4 hours (a shorter stay in freezer works too). Meanwhile, place watermelon in blender to liquefy. Cover and transfer to fridge to cool overnight. To begin process of making sorbet, transfer watermelon mix to a bowl. Add lime juice and zest. Set aside. Strain simple syrup through a fine mesh sieve to remove mint leaves. Working in stages, begin by adding a bit of the strained syrup to your watermelon base. *Then, to test sweetness level, place egg in bottom of bowl to see if it rises. You need to view about a nickel size bit protrude through surface of watermelon mix. If not yet spotted, remove egg and continue adding simply syrup and performing egg float test until you get this visual. Once the desired sweetness has been achieved, you can move on to sorbet making, following the manufacturers directions for your particular machine. (With my machine, a Cuisinart ICE-21, it took about 8 to 10 minutes to achieve the right consistency.) If not served straight away, transfer mix to a freezer safe container with an airtight lid and store in freezer (door, is best). You may have to set your sorbet out for 10 to 20 minutes prior to serving, once frozen, depending on how firm it is. Note: As a nod to the mojito-like ingredients, adding a bit of white rum (a tablespoon or so)… or most any alcohol (because it doesn’t freeze)… will aid in avoiding over freezing. Sugar helps the consistency as well but you don’t want to overdo the sweetness to get soft sorbet! !